Introducing the third release from Manchester techno artist Your Silent Face, the 'Entanglement EP'. In this follow up to the hypnotic jams and dystopian soundscapes of his previous 'Red Rain' EP, Your Silent Face's follow up gives a nod to quantum physics, mathematical patterns and modular synthesis. Multilayered with sounds that open out and scatter, peak and fade, this EP is full of fizz, spooky action and walls of sound. The second EP on his own label, Tethys Records, the Entanglement EP opens with Entanglement (Disentangled), a straight forward deep techno burner, with minimal acid lines leading to deep cavernous washes of synth and back again. The second track, Von Neumann Entropy, introduces more industrial and martial sounds, borne of metallic found sound straight from Manchester's factories, its industrial feel immediately bringing to mind the city's heritage. Track three, Spukhafte Fernwirkung, gives us might be the sound of a black hole collapsing in on itself, or of the death rattle of a decaying Higgs Bosun; what it definitely is, is the sound of a deep modular-driven drone, a resonant, deep soundscape. 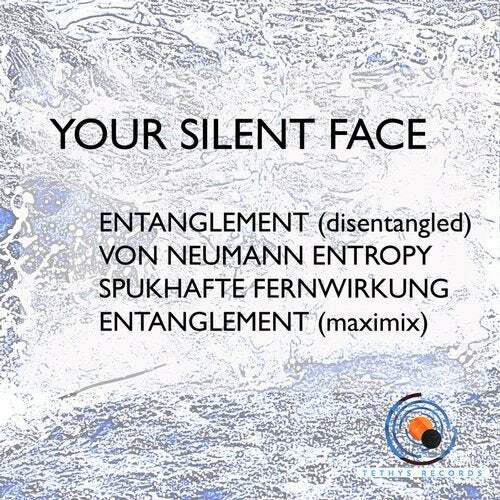 The final track, the Entanglement Maximix, takes the sounds hinted at in the disentangled mix and creates an intense wall of sound, with a driving kick, for a track that fills the room in waves before dissipating, like the entropic pattern of a quantum event. Intelligent, complex and diverse, this EP offers dancefloor drivers, industrial influences and low-pitched, sonorous drones.